Two fourth-year students in the textiles program at NSCAD organized a Christmas sale last week that successfully raised a $400 donation for their department. Megan Mather and Emma Poliquin had 27 participating artists and sold more than 45 items at the Nov. 29 and 30 event. Mather said the sale is an option for students to sell items they have made, and make some extra money at Christmas time. The event also allows the public to see what they can do. NSCAD donated space, tables, electricity, and supplying a credit and debit machine and the department kept 20 per cent of the sales as a fund for the textile studio. “Each artist will get 80 per cent of whatever they have sold from their products,” Mather said. NSCAD fourth-year textiles and fashion student, Janelle Brown, marketed seven original hats each for around $65 to $70. The hats were exhibited at the Anna Leonowens Gallery as part of her graduation show. Each hat took almost 40 hours of work. Laura Collins, a fourth-year student at NSCAD, made double-sided scarves from scrap fabrics that were left over by the fashion department. Each was priced at $15. Graduate, Kassandra Simon, brought some hammocks that she had made in order to participate in the event. “I wanted to help the studio to raise the money,” she said. Judy Poliquin, Emma’s mother, spent $104 on some natural hand-dye wools which she bought for her mother as a gift. Her favorite colour was orange and the wool will be used for knitting scarves. She appreciated that people are supporting the students’ talents and giving them a chance to experience what real business is like. “They made a product, priced it, sold it, and people appreciate it,” she said. 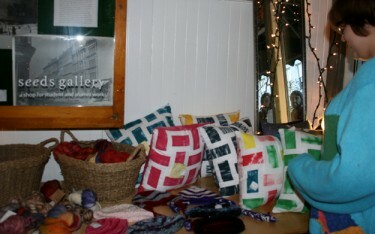 NSCAD student, Keisey Pearson, walked in and bought a handkerchief before the sale ended. She said she knows how hard it is for a student trying to sell their own work in Halifax. The sale ran smoothly. The only difficulty they have faced was pricing products, “because there’s a difference between perceiving values and the actual value of the piece,” says Mather. Poliquin and Mather are hoping the textile sale will become an annual event every Christmas. NSCAD’s jewelry show opens on Dec. 4 and the ceramics event is on Dec. 10.